Nutberry Suet Blend™ combines all of nature’s best in one delicious blend. Attract fruit and insect loving songbirds to your feeder with this unique mix of premium fruits, preferred nuts, nutritious insect suet kibbles, and whole kernel sunflower meats. Bluebirds, warblers, robins, woodpeckers and more absolutely love this special treat. 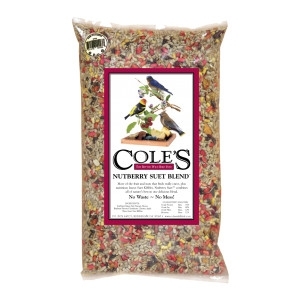 This is the ultimate trail mix for your wild birds!